USSR: The Bolsheviks cross into Polish territory and begin their advance on Warsaw. Germany: Clashes between Nazi Party protesters, communists and the local police in Hamburg result in 19 killed and 285 wounded. Spain: Day 1 of 985 of the Spanish Civil War. An uprising begins in Spanish Morocco as Nationalist rebels begin a revolt against the Spanish garrisons. This marks the beginning of one of the most brutal and bloody civil wars in history and a dress rehearsal for Hitler's war machine. When an initial military coup failed to win control of the entire country, a bloody civil war ensued, fought with great ferocity on both sides. The Nationalists, as the rebels were called, received aid from Fascist Italy and Nazi Germany. 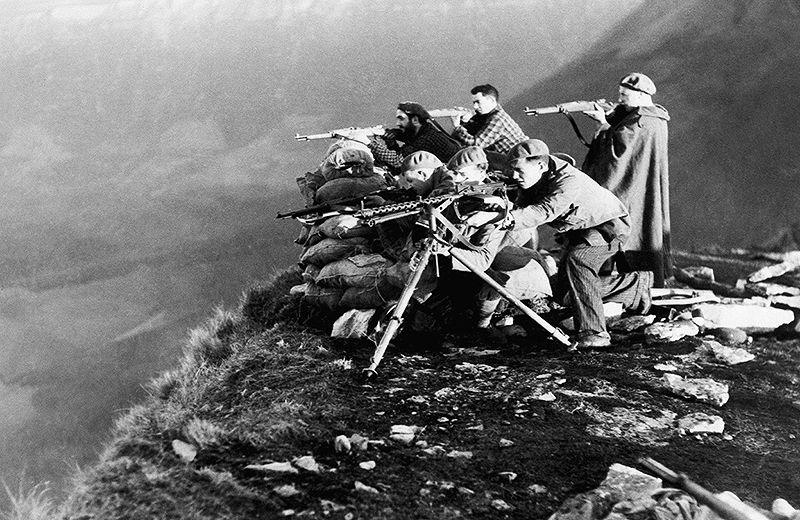 The Republicans received aid from the Soviet Union, as well as from International Brigades, composed of volunteers from Europe and even the United States. The war was an outcome of a polarization of Spanish life and politics that had developed over previous decades. On one side, the Nationalists were for the most part important military men, most of the landowners and many businessmen. They were a Falangist group led by General Francisco Franco. On the other side, the Republicans were primarily the urban workers, agricultural laborers and many of the educated middle class. They were loyal to the current Second Spanish Republic (he short-lived First Spanish Republic emerged in 1868 after the overthrow of Queen Isabella II). For both Adolf Hitler and Benito Mussolini, the Spanish Civil War would be an ideal testing ground for their ground and air weaponry and a chance to flex their ideological muscle on a world stage. The Spanish Civil War will finally come to an end on 28 Mar 39 with Franco on top. Franco will then brutally rule Spain for the next 36 years, until his death in 1975. Spain: Day 366 of 985 of the Spanish Civil War. CBI - China: Day 11 of 2,987 of the 2nd Sino-Japanese War. Day 11 of 33 of the 2nd Battle of Hebei. Day 4 of 22 of the Battle of Tainjin-Beijing. Chiang sends his troops up north to reinforce the Chinese. Spain: Day 731 of 985 of the Spanish Civil War. CBI - China: Day 376 of 2,987 of the 2nd Sino-Japanese War. Day 37 of 139 of the Battle of Wuhan. CBI - China: Day 741 of 2,987 of the 2nd Sino-Japanese War. Day 34 of 68 of the Battle of Tianjin. CBI - Mongolia: Day 68 of 129 of the Battle of Khalkhin Gol, a border dispute between the Soviet Union and Japan. Atlantic: The British mooring vessel HMS STEADY hits a mine and sinks off Newhaven in southern England. Atlantic: Sea actions near Ireland: Off the south coast, German sub U-34 sinks the Greek ship NAFTILOS while German bombers sinks the Estonian ship LEOLA. Northwest of Bloody Foreland, U-43 sinks the British ship FELLSIDE. Atlantic: North of Scotland, U-57 sinks the Swedish ship O A BRODIN and the British ship MANIPUR. Meanwhile, 5 miles off the Netherlands, British sub H-31 sinks the German anti-submarine trawler STEIERMARK. ETO - UK: Day 8 of 114 of the Battle of Britain. The Luftwaffe bombs Bristol in western England and Scottish industrial towns along the east coast. ETO - France: After sundown, the RAF bombs targets in Caen. ETO - France: The first anti-Jewish measures are taken in Vichy France. MTO - Malta: Italian bombers sink the Finnish ship WIIRI 30 miles off of Malta. East Africa: Day 38 of 537 of Italy's East African campaign in the lands south of Egypt. CBI - China: Day 1,107 of 2,987 of the 2nd Sino-Japanese War. Day 246 of 381 of the Battle of South Guangxi. Under extreme diplomatic pressure from Japan, Britain agrees to close the Burma Road, a vital supply route for the Chinese army. South America: Day 13 of 27 of the Ecuadorian-Peruvian War, a territorial dispute between Peru and Ecuador. ETO - UK: After sundown, the Luftwaffe bombs Hull in Yorkshire. Germany: The first elements of the Spanish Volunteer Division arrive at the large training camp at Grafenwöhr in Bavaria. Spanish uniforms are exchanged for German ones but they retain their Falangist dark blue shirt, from which they become known as the Blue Division. Germany: Reinhardt Heydrich orders the four SS Einsatzgruppen under his command to exterminate Jewish and Roma communities within his sphere of influence. USSR: The Political Commissars are reintroduced into the organizational structures of the Soviet Army and Soviet Navy. Russian Front - Finland: Day 19 of 142 of Operation SILVER FOX, a joint German-Finnish campaign to capture the Russian port of Murmansk in the Arctic. Russian Front - Finland: Day 17 of 140 of Operation ARCTIC FOX, a joint German-Finnish campaign against Soviet Northern Front defenses at Salla, Finland. Russian Front - Finland: Day 26 of 164 of the Battle of Hanko. Russian Front - Finland: Day 8 of 18 of Finland's reconquest of Ladoga, Karelia. The Finns continue their offensive on Lake Ladoga northeast of Leningrad. Russian Front: Day 26 of 167 of Germany's Operation BARBAROSSA, the invasion of the USSR. Russian Front - North: Soviet troops continue to advance in the Lake Ilmen area near Leningrad. Russian Front - Center: Day 12 of 31 of the 1st Battle of Smolensk, Russia. Russian Front - Center: Day 5 of 12 of the Battle of Zhlobin, Belarus. Russian Front - South: In Ukraine, units of German Army Group South continue preparing for a major assault on Kiev. Russian Front - South: Day 3 of 25 of the Battle of Uman, Ukraine. The Romanian 3rd Army reaches the Dniester River. Russian Front - South: Day 16 of 21 of the Battle of Bessarabia, Russia. German and Romanian troops continue their attack at Bessarabia to take the land and city that Romania was forced to cede to the USSR a year ago. MTO - Malta: Axis warplanes attack the airfields on Malta. MTO - Italy: The Italian Navy introduces a new cipher code. MTO - Libya: Day 99 of 256 of the Siege of Tobruk. East Africa: Day 403 of 537 of Italy's East African campaign in the lands south of Egypt. CBI - China: Day 1,472 of 2,987 of the 2nd Sino-Japanese War. Atlantic: Churchill warns Stalin that, in the aftermath of the convoy PQ-17 disaster, no further convoy missions are being planned for northern Russia in the foreseeable future. Atlantic: The RAF sinks the German sub U-751 northwest of Cape Ortegal, Spain. Germany: Himmler visits Auschwitz-Birkenau for two days for an inspection. He observes the extermination process from start to finish with two trainloads of Dutch Jews. Russian Front - North: Day 313 of 872 of the Siege of Leningrad. Russian Front - North: Day 74 of 658 of the Siege of the Kholm Pocket. Russian Front - Center: Day 16 of 22 of Germany's Operation SEYDLITZ, a plan to trap and capture numerous Soviet troops. Russian Front - South: Day 20 of 27 of the Battle of Voronezh, Russia. Russian Front - South: Day 20 of 150 of Germany's CASE BLUE, the failed offensive to take the Caucasus oil fields. German Army Group South continues on toward Stalingrad. MTO - Greece: German occupation troops conduct an anti-partisan operation at Trifolo, near Katerini, rounding up suspected resistance fighters and executing all the suspects en masse. Hitler orders more reinforcements for the Balkan Peninsula. MTO - Egypt: Day 17 of 27 of the 1st Battle of El Alamein. Italian troops hold off an Australian-British joint attack at Miteirya Ridge. MTO - Libya: US B-24s bomb Bengasi harbor while B-17s hit Tobruk. East Africa: Day 74 of 186 of the Battle of Madagascar. East Africa: German sub U-178 sinks the transport CITY OF CANTON northeast of Beira, Mozambique, in the Indian Ocean. CBI - China: Day 1,837 of 2,987 of the 2nd Sino-Japanese War. Day 64 of 124 of Japan's Zhejiang-Jiangxi Campaign, launched to punish anyone suspected of aiding the Doolittle raiders in China. Roughly 250,000 Chinese will be killed. PTO - Alaska: Day 41 of 435 of the Battle of Kiska, Aleutian Islands. US 11th Air Force bombs shipping and the North and South Heads of Kiska Island. PTO - Malaya: Day 149 of 357 of the Battle of Timor Island. PTO - New Guinea: US 5th Air Force bombs the harbor at Rabaul on New Britain Island. ETO - Netherlands: US 8th Air Force B-17s accidentally drop their bombs on civilian homes, killing 150. Russian Front - North: Day 678 of 872 of the Siege of Leningrad. Russian Front - North: Day 439 of 658 of the Siege of the Kholm Pocket. Russian Front - Center: Day 13 of 50 of the Battle of Kursk, Russia. Russian Front - Center: Day 6 of 38 of the Battle of Orel, Russia. German tanks stop the Soviet advance north and west of Orel. Russian Front - South: Day 5 of 48 of the USSR's Lvov-Sandomierz Offensive. MTO - Italy: Day 9 of 40 of the Battle of Sicily. RAF and US Air Forces provide air support. US troops capture Porto Empedocle. An Allied military government (Amgot) is set up in Sicily. CBI - China: Day 2,202 of 2,987 of the 2nd Sino-Japanese War. PTO - Alaska: Day 406 of 435 of the Battle of Kiska, Aleutian Islands. PTO - New Guinea: Day 87 of 148 of the 2nd Battle of Lae-Salamaua. US 5th and 13th Air Forces provide air support. PTO - Solomon Islands: Day 28 of 67 of the Battle of New Georgia. US 5th and 13th Air Forces provide air support. The US Army and Marine Corps make a successful joint offensive at Laiana Beach. 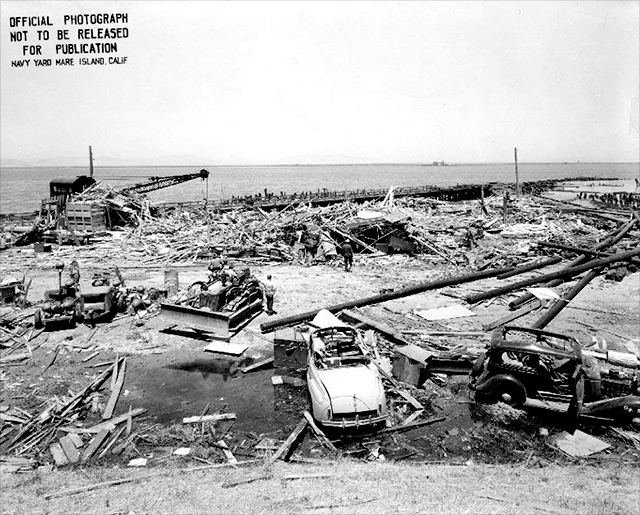 USA: Two ammunition-laden transport ships explode while docked at Port Chicago, California, killing 320 sailors and 390 other military personnel in what becomes the worst stateside disaster of the war. Many of the dead and injured are enlisted African-American sailors loading ammunition under unsafe conditions. 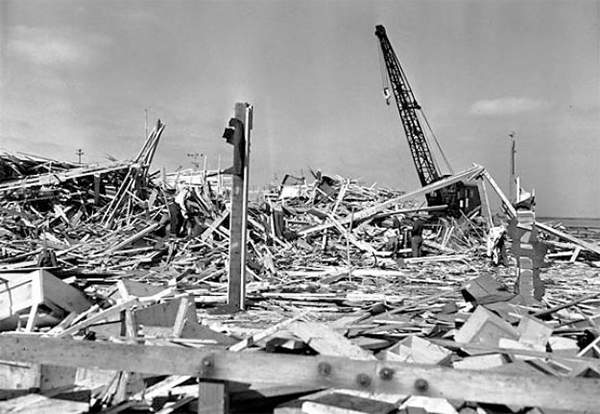 On 08 Aug 44, continuing unsafe conditions will inspire hundreds of naval servicemen to refuse to load munitions, an act known as the Port Chicago Mutiny. Fifty men - called the "Port Chicago 50" - will be court-martialled, convicted of mutiny and sentenced to long prison terms. 47 of the 50 will be released in January 1946; the remaining three will serve additional months in prison. Widespread publicity surrounding the case turned it into a cause celebre among African-Americans and white Americans; it and other race-related Navy protests of 1944-1945 led the Navy to change its practices and initiate the desegregation of its forces beginning in February 1946. Atlantic: The largest convoy of the war embarks from Halifax, Nova Scotia, under Royal Canadian Navy protection. Atlantic: Off Narvik, Norway, an RAF B-24 Liberator sinks the German sub U-347 while an RAF Catalina sinks U-361. Off Bergen, RAF planes flown by Norwegians damage U-994. ETO - UK: Day 35 of 86 of the V-1 "Buzz Bomb" offensive on Britain. ETO - France: Day 42 of 49 of Operation OVERLORD, the Allied invasion of Normandy, France, known forever simply as D-Day. D-Day+41: Allied Air Forces provide air support. The US continues making small gains toward St Lo. ETO - France: Day 42 of 62 of the Battle of Caen. Rommel is wounded when his staff car is strafed by a British fighter. ETO - France: Jellied fuel Napalm bombs are used for the first time in the war when 14 P-38s of the 402nd Fighter Squadron attack a fuel depot at Coutances, near St Lo. USSR: 57,600 German prisoners of war are paraded through the streets of Moscow. Russian Front - Finland: Day 3 of 3 of the Battle of Nietjarvi, Karelia. The Finnish counter-attack stops the Soviets, forcing them to withdraw. Russian Front - Finland: Day 27 of 50 of the Battle of Karelia. Soviet troops continue their offensive against the Finns in eastern Karelia between Lake Ladoga and Lake Onega in northern Russia. Russian Front - North: Day 167 of 191 of the Battle of the Narva Isthmus, Estonia. Both German and Soviet troops remain locked in their defensive positions. Russian Front - Center: Day 13 of 16 of the Battle of Vilnius, Lithuania. Russian Front - Center: Day 13 of 27 of the Battle of Siauliai, Lithuania. Russian Front - Center: Day 13 of 23 of the Battle of Belostock, Poland. Russian Front - Center: Day 5 of 15 of the Battle of Lvov, Poland. The Soviets begin to encircle 40,000 German troops at Brody, Poland (now in Ukraine), in what becomes known as the Brody Pocket. Russian Front - Center: Day 5 of 15 of the Battle of Stanislav, Poland. MTO - France: US 15th Air Force bombs targets at Avignon, Arles and Tarascon. MTO - Italy: Day 32 of 34 of the Battle of Ancona (north of Rome). Allied Air Forces provide air support. British 8th Army pushes toward Florence. US 5th Army captures Luciana and reaches the Arno River Valley. CBI - Burma: Day 135 of 166 of the UK's Operation THURSDAY. US 10th Air Force provides air support. An inspection of the Indian 111th Infantry Brigade, a Chindit unit, shows that only 118 are completely fit for active service. The remaining 2,200 men are suffering from malaria, foot rot, septic sores, typhus or other ailments related to the Burma jungles. CBI - Burma: Day 130 of 147 of the Battle of Myitkyina. US 10th Air Force provides air support. CBI - Burma: Day 108 of 302 of the Chinese Salween Offensive. US 14th Air Force provides air support. CBI - China: Day 2,568 of 2,987 of the 2nd Sino-Japanese War. Day 92 of 259 of Japan's Operation ICHI-GO. Day 26 of 48 of the Battle of Hengyang. US 14th Air Force provides air support. In the South China Sea the USS GUARDFISH, USS PIRANHA and USS THRESHER sink a Japanese freighter and a cargo ship. At night, the USS CABRILLA sinks an oiler and two transport ships. CBI - Indonesia: The Royal sub HMS TELEMACHUS sinks the large Japanese submarine I-166 in the Malacca Straits. PTO - Dutch New Guinea: Day 16 of 61 of the Battle of Noemfoor. Although the island has been declared secured, bitter fighting from Japanese continues. PTO - Japan: The USS GABILAN sinks a Japanese minesweeper south of Japan. PTO - Mariana Islands: US 7th Air Force B-25s bomb targets on Ponape Island. PTO - New Guinea: Day 52 of 83 of the Battle of Biak. There are still 3,000 Japanese soldiers on the island who won't give up. PTO - New Guinea: Day 216 of 597 of the Battle of New Britain. US 13th Air Force provides air support. PTO - New Guinea: Day 87 of 481 of the Battle of Western New Guinea. 5th Air Force provides air support. PTO - New Guinea: Day 34 of 80 of the Battle of Lone Tree Hill. PTO - New Guinea: Day 8 of 47 of the Battle of Driniumor River, a failed Japanese offense on US troops near Aitape. PTO - Solomon Islands: Day 260 of 295 of the Battle of the Bougainville Islands. US 13th Air Force provides air support. Germany: At the Potsdam Conference, Truman, Stalin and Churchill set up a Control Council to administer post-war Germany. Italy: Rescue tug HMS ATHLETE hits a mine and sinks off Leghorn, Italy. CBI - China: Day 2,933 of 2,987 of the 2nd Sino-Japanese War. US 14th Air Force attacks truck convoys in the Siang Chiang Valley and bomb the area along the river at Hengyang. PTO - Alaska: Two US 11th Air Force B-25s are forced to land at Kamchatka in the USSR, becoming the last US aircrew interned in the USSR during the war. PTO - Borneo: Day 38 of 67 of the Battle of North Borneo. US 5th and 13th Air Forces provide air support. PTO - Dutch East Indies: Day 17 of 21 of the 2nd Battle of Balikpapan. PTO - Japan: The Royal Navy makes their first attack on the Japanese home islands, as their carrier planes hit the airfields at Kionoke, Naruto and Miyakawa. US Navy ships bombard Hitachi. PTO - New Guinea: Day 568 of 597 of the Battle of New Britain. US 10th Air Force provides air support. PTO - New Guinea: Day 452 of 481 of the Battle of Western New Guinea. US 10th Air Force provides air support. PTO - Philippines: Day 270 of 299 of the 2nd Battle of the Philippines, aka the Liberation of the Philippines or the Philippines Campaign. PTO - Philippines: Day 215 of 244 of the Battle of Luzon. The battle is said to over but hold-outs will continue fighting until the end of the war. PTO - Philippines: Day 130 of 159 of the Battle of Mindanao Island. The battle is said to over but hold-outs will continue fighting until the end of the war. PTO - Philippines: Day 122 of 135 of the Battle of the Visayas region. The battle is said to over but hold-outs will continue fighting for several weeks.